Over the past three amazing years, MakerBot owners and enthusiasts around the world have shared knowledge with us and with each other. As we welcome thousands more MakerBot owners and users into the MakerBot family, we want to make sure that everyone always has the best information regarding our company and products, and that it's easily accessible. Here’s one thing we're doing to help: on December 31, as we close out the year, we will also turn off the lights at wiki.makerbot.com. The MakerBot wiki has served us well, but lately we've seen an increase in spam and a decline in community activity. Instead of continuing to maintain two separate sites, we're going to consolidate them. What that means is that, as of December 31st, the MakerBot wiki will no longer be available at this address. An archived version of the wiki as it stands today will be available at makerbot.com/support/archive and more former wiki content will be available at makerbot.com/support, which already hosts PDFs of some of the most useful Thing-O-Matic and Cupcake documentation. You may see some short periods of downtime as we finish moving this content. An archive of forum discussions will be available, but users seeking discussion with the incredibly knowledgable MakerBot community should head over to the MakerBot Operators Google Group. Requests for help and questions about MakerBot products should, as always, be sent to moc.tobrekam|troppus#moc.tobrekam|troppus. Thanks for your contributions over the past few years to the MakerBot wiki. We hope you'll all continue to share your expertise with us and other MakerBot users for many years to come. The Replicator is the ultimate personal 3D printer. It comes with an onboard LCD interface, a build area of over 300 cubic inches, and, with optional dual extrusion, the capability to print in two colors at once. The Replicator is assembled and tested before shipment, so you’ll be able to turn it on and start printing within minutes of taking it out of the box. To learn more or to see the Replicator User Guide, check out the main Replicator page. The Thing-O-Matic is the first fully automatic, low-cost, DIY 3D printer. A completely hands-free operation, just click a button and this machine will make your design! It can even handle back-to-back copies. The Thing-O-Matic really is a factory for your desktop. The Cupcake is our pride and joy. Easy to build, easy to run, and easy to use, this 100% open source 3D printer is built to be hacked or just loved, and is beginner friendly. Read more about the CupCake CNC. The latest version of the MakerBot extruder, compact and reliable. Our first extruder exclusively for use with 1.75mm filament stock. Designed for reliability, low maintenance, and ease of use, the StepStruder™ MK6 revolutionizes plastrusion once again with stepper driven extrusion. It combines the reliability of the MK5 with a high torque stepper motor to provide precision control of your extrusion. Read more about the Stepstruder MK6. The MakerBot Gen 4 Interface Board Kit v1.1 allows you to operate your Thing-O-Matic or Generation 4 Electronics without the need for a computer! It's a freestanding control surface for your Bot, and programmable too! Take your graphics from the computer to the real world with this awesome drawing implement. On top of being a great platform for art and experimentation, the Unicorn Pen Plotter expands the capabilities of your 3D MakerBot printer into the realm of 2D, and even opens the door to the possibility of producing your own custom printed circuit boards. The Automated Build Platform v1.0 is a totally new way of printing your 3D objects. For the first time ever multiple objects can be printed in succession without the need for human intervention! A filament spindle is a critical upgrade for your MakerBot, especially if you do lots of printing. It keeps your filament dry, clean, and prevents tangles that are the nightmare of anyone who has ever printed without one. Read more about the Filament Spindle MK1. The MakerBot 3D Scanner is a compact three-dimensional scanner mount fit for your pico projector, webcam, iPod, or iPhone! It’s an experimental platform for 3D scanning. Read more about the MakerBot 3D Scanner. The Frostruder MK2 is a radically different approach to frosting extrusion. Instead of using a motorized plunger approach such as with the Frostruder MK1 and Fab@Home paste extruders, we've switched to air power. Read more about the Frostruder MK2. The Heated Build Platform is an add-on for any model of MakerBot that makes it easier for the prints to stick to it as you print your 3D objects. How to build, troubleshooting, FAQ, and tips and tricks.. The Plastruder is the MakerBot’s main print head. 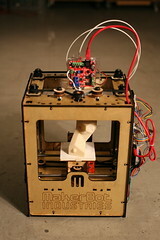 You can feed it many different kinds of plastic and it allows you to print solid 3D objects. 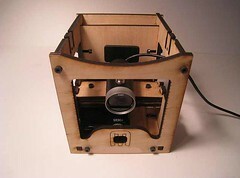 Read more about the Plastruder MK4.